since the insects can't help approaching the natural viewing wavelength(360~400nm). And when they touch the metal grid, they will be zapped by electricity quickly. - 4 watt LED ultraviolet tube, not dazzling, you will not feel the light when you close your eyes. - No noise, giving you a quiet night's sleep, care for your baby, parents. - Utilizing the phototaxis of mosquitoes, the zapper is highly attractive to insects. - The coverage area of the mosquito killer is up to 215 sq. Ft(20㎡), which can be perfectly used for indoor home, kitchens, office, outdoor patios, restaurants, yards, etc. Our mosquito killer lamps are designed with protective shield for home use. Do not need to worry about your children coughing and choking. No scalding risk of electric shock. The power consumption of this light is only 4 W, save your electricity bill, no need of changing frequently. High quality LED tubes, more conducive to heat dissipation, prolong the lifespan of this zap light. This YUNLIGHTS bug killer is sold with a full one-year money-back guarantee. 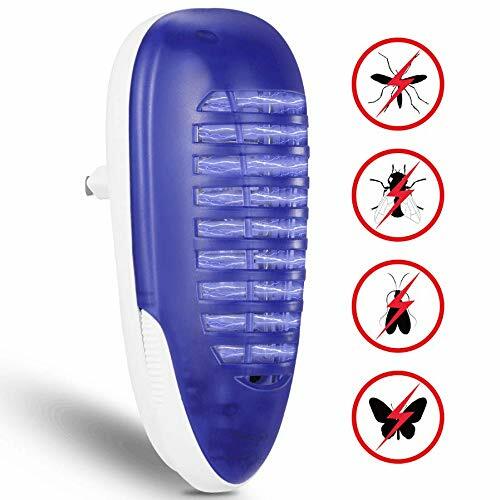 【EFFECTIVELY KILL MORE THAN MOSQUITOES】- Features 365NM bright LED ultraviolet tube that attracts all pesky flying insects into the device, then getting them instantly trapped and killed by the high-voltage charging metal grid. Kill the bacteria that comes with mosquitoes to avoid producing secondary pollution. 【POWERFUL & QUIET & MORE DURABLE】- Effective for an area of up to 215 sq. Ft with low noise design, create a comfortable environment to help you fall asleep. 4W energy efficient LED tubes for longer use, no need of changing frequently. Can be used for indoor home, kitchens, office, patios, restaurants, yards, etc. 【SIMPLE OPERATION & EASY TO CLEAN】- Just plug in the mosquito light into a regular wall outlet, watch the device eliminate all pesky and annoying flies immediately, faster than other products. Built-in a detachable plastic tray which collecting dead insect and can be easily removed. Convenient for you to dispose and clean. 【SAFE & CHEMICAL-FREE INSECT TRAP】- Purely physically safe mosquito zapper with light-sensing anti-mosquito technology. Get rid of all flying insects and bugs. No chemicals are involved in this mini bug zapper. Non-toxic, No side effects. Available for young children, pregnant women and the elderly. 【NO-RISK PURCHASE &1 YEAR GUARANTEE】- YUNLIGHTS fly zapper protects and prevents against annoying and disease carrying flies and insects! Please remember to turn off other lights, close the windows and door, leave this insect killer on in your room for whole night! If you're unsatisfied with this item for any reason, we'll immediately refund your purchase price.